I have been voted as the chair person for the vegetable dish for Black History month at work, and needed a recipe. 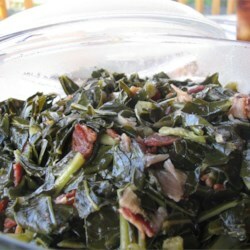 I am a true collard fan, and have always tried the five star recipes and have never been disappointed. WHOA! Best greens I have had and can't believe I cooked them. Only made a couple of changes which include I cut out the olive oil and used the bacon grease. I also used plenty of bacon (about a pound, as I love the flavor) and although skeptical, I added about 1 TBS. of brown sugar. These greens are wonderful--I can hardly wait to cook them for my workgroup! THANKS for SHARING.